A many-layered story of lost loves and covered-up crimes…. Park ranger Callie Major doesn’t expect to encounter someone from her past when she comes across an illicit campsite, but the camp’s resident is Newton Denman, Callie’s one-time best friend. As the narrative moves between the two characters, more is revealed about why Newton is on the run—he’s the primary suspect in a murder he had nothing to do with—and why Callie returned to the mountain where she lived as a young child. The book moves back and forth between the characters in the park and those in Callie and Newton’s former hometown, including Newton’s mother and brothers, and Pete Myrick, the police officer investigating the murder, who has his own history with Callie. Multiple plotlines converge in this complex, satisfying nature story. Newton Denman, a compassionate man raised in a family of hunters, is hiding out in the Alleghenies when he spots Callie Major swimming in a mountain pool. They have not spoken since the disaster that tore them apart when they were children in Littlecomb, Pennsylvania. Callie, half-Irish and half-Seneca, is a forest ranger who is somewhat absentminded and given to a state of what she terms as near hibernation. Though she is loath to trust Newton the two are drawn to one another. Newton, however, does not know that Callie is protecting a mysterious, goliath bear in the forest or that she is guarding another highly personal secret. As for Callie, she has no idea that Newton is hunting this same black bear who is legend in the area, or that he is on the run from a charge of murder in their hometown. While Callie and Newton are the heart of this story, the presence of a totemic bear adds a supernatural element and deepens the suspense. Bears have a powerful hold over the human psyche and we have a history of both conflict and communion with them, not unlike our relationship with each other, and nature itself. I wrote this novel when I was supposed to be doing something else. The Tracking Heart took over my life when I was in grad school at The University of Pennsylvania. I was supposed to be writing my thesis but instead found myself secretly writing about Callie and Newton -- not to mention the bear -- who entered my dreams the night I looked out my window and saw a glossy, recently killed black bear in my neighbor's pickup truck. I was living next door to a family of hunters, the youngest of whom befriended my son. This youngest boy ('Nature' he was called) had family duties that included skinning animals, and setting and checking traplines. He was not eager to start hunting, as was expected of him. About this time, I was struck by a newspaper article in the Philadelphia Enquirer about a man so obsessed with hunting a huge black bear that he crossed the West Virginia state line into the Pennsylvania Allegheny Mountains where he pursued this animal, illegally. The bear, finally shot, had the second largest black bear skull recorded in North America. The bear continued to prowl my dreams and I decided I wanted to write a story about a woman with close ties to nature and a man who is a hunter. These two, at odds with one another, fall in love, only to be tested by their obsession with a supernatural black bear. I wrote a first draft of The Tracking Heart, but had to put it aside in order to finish my doctoral thesis and earn a living to support my children. Along the way I got my masters in creative writing at The University of Pennsylvania, taught writing workshops and American literature there for seven years, and began to publish in nationally distributed literary magazines such as "The Massachusetts Review". While at Penn, my research into the archetypal American landscape and myths about bears, from tall tales to hunting stories by Faulkner also planted a seed for my novel to come. A little over a year ago I was finally able to revisit Callie and Newton, and to give myself to the story fully. Melissa Croghan writes with grace and ease about her vivid cast of complicated characters and the result is a morally complex and deeply suspenseful novel. My first impulse on finishing The Tracking Heart was to set out in search of Callie and Newton and especially the bear. A splendid debut. 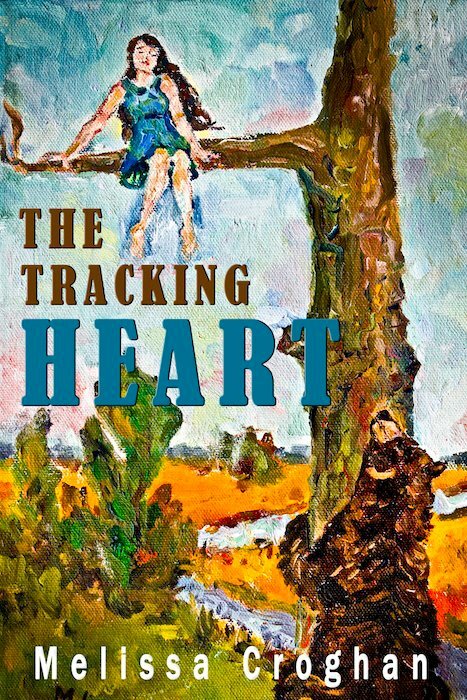 The Tracking Heart draws you in with its unanswered questions, its aura of mystery and danger and threat, not to mention its straightforward narrative verve. What keeps the reader turning the pages, though, are the layered relationships, the love and longing, reversal and betrayal, all writ large against the backdrop of Pennsylvania's mountain wilderness. It's a story of family and community and the strains we often unthinkingly place upon them both, and it's also a love story that manages to be both contemporary and timeless.